NEWARK, N.J. (AP) — A convicted appointee of former New Jersey Gov. Chris Christie has joined his co-defendant's appeal to the U.S. Supreme Court. TRENTON, N.J. (AP) — New Jersey will pay a law firm assisting Gov. Phil Murphy's task force investigating tax incentives $395 an hour. NEWARK, N.J. (AP) — A resentencing has been pushed back for a onetime aide to former New Jersey Gov. Chris Christie in the George Washington Bridge lane-closing scandal. NEWARK, N.J. (AP) — A onetime aide to former New Jersey Gov. Chris Christie will be resentenced next month for her role in the George Washington Bridge lane-closing scandal. TRENTON, N.J. (AP) — President Donald Trump could miss out on being on the 2020 ballot in New Jersey if he doesn't disclose his tax returns under a bill now advancing. TRENTON, N.J. (AP) — Tax incentives that New Jersey enacted during Chris Christie's administration to lure businesses to the state are set to expire this year, and Gov. Phil Murphy wants to scrap his predecessor's proposals. But his fellow Democrats who control the Legislature drafted the incentive programs that Murphy opposes and are skeptical about an audit the first-year governor conducted. FREEHOLD, N.J. (AP) — New Jersey is back in the horse racing business. The return of state support is good news for tracks that have struggled to compete with rivals in adjacent states that offer casino gambling as well. New Jersey Gov. Phil Murphy signed a bill Thursday providing $20 million to help boost racing prizes this year. Although the legislation calls for $20 million each year for the next five years, future subsidies will depend on how each year's budget shapes up. NEWARK, N.J. (AP) — A onetime staffer to former New Jersey Gov. Chris Christie plans to appeal her conviction in the George Washington Bridge lane-closing case to the U.S. Supreme Court, according to recently filed court papers. POINT PLEASANT BEACH, N.J. (AP) — After Superstorm Sandy pummeled the New Jersey coast, then-Gov. Chris Christie set out to build protective sand dunes along most of the state's 127-mile (204-kilometer) shoreline. ATLANTIC CITY, N.J. (AP) — New Jersey lawmakers passed a measure Thursday that would restore government subsidies for the state's horse racing industry. The state Assembly and Senate gave final approval to a bill providing $20 million a year for five years to the racing industry as it struggles to compete with out-of-state tracks that have casino gambling. The bill now goes to the desk of Democratic Gov. Phil Murphy. 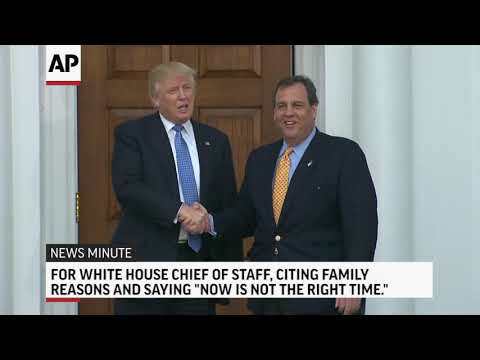 NEWARK, N.J. (AP) — A former aide to former New Jersey Gov. Chris Christie faces resentencing next month for his role in the George Washington Bridge lane-closing scandal. Bill Baroni is scheduled to appear in court in Newark on Feb. 26, according to an order filed by a federal judge last week. CAMDEN, N.J. (AP) — Gov. Phil Murphy said Wednesday his administration has added opioid addiction to the list of eligible illnesses in New Jersey's medical marijuana program as part of a new push to combat the state's drug crisis. Q&A: Why are tax incentives taking center stage in NJ? New Jersey Gov. Phil Murphy took aim at $11 billion in tax credits handed out under his predecessors, casting them as a failure and proposing new awards that cap how much the state would give out. TRENTON, N.J. (AP) — A new state audit says the New Jersey agency responsible for awarding billions of dollars in tax credits if companies created or retained jobs failed to determine if those benchmarks were met. The state comptroller's office released the audit Wednesday as required by Democratic Gov. Phil Murphy's executive order. TRENTON, N.J. (AP) — A one-time associate of former New Jersey Gov. Chris Christie is backing off his efforts to appeal his convictions in the George Washington Bridge lane-closing case. NEW ORLEANS (AP) — Former New Jersey Gov. Chris Christie wants lawmakers across the country to resist a bill that would give the federal government control over regulating sports betting. The Republican said Friday at a conference of legislators that states have proven they can handle the job. Christie began a court battle against the major pro and college sports leagues that ended with the U.S. Supreme Court clearing the way for all states to choose whether or not to offer sports gambling. TRENTON, N.J. (AP) — New Jersey bolstered its reputation as one of the country's highest-taxed states in 2018, raising rates on high income earners, businesses and motorists, and posting yet again among the nation's highest average property tax bills. Some rates, though, like the estate and sales taxes declined. TRENTON, N.J. (AP) — New Jersey's public worker benefits programs should leverage their size to drive down costs, Gov. Phil Murphy's administration said in a report Friday, stopping short of calling for cuts to worker benefits sought by lawmakers and the governor's predecessor, Chris Christie. The Democratic administration's task force unveiled the 12-page interim report Friday, promising to continue to examine its "larger charge" of pursuing long-term reforms. TRENTON, N.J. (AP) — New Jersey is considering renewing financial subsidies to its horse racing industry. Former Gov. Chris Christie, a Republican, ended state support for the industry seven years ago, diverting the money to help struggling Atlantic City. But under his Democratic successor, Phil Murphy, the state is advancing a $100 million plan to subsidize the racing industry. NEWARK, N.J. (AP) — A federal appeals court upheld most of the convictions Tuesday against two former allies of former New Jersey Gov. Chris Christie in the George Washington Bridge lane-closing case, a scandal that helped derail Christie's presidential hopes in 2016. Bridget Kelly and Bill Baroni were convicted in 2016 in the alleged plot to cause traffic jams to punish a mayor for not endorsing Christie's re-election bid. TRENTON, N.J. (AP) — New Jersey Gov. Phil Murphy says the state has reached a four-year, $84 million labor contract with a corrections officers' union. Murphy announced the deal with the Policemen's Benevolent Association Local 105 on Tuesday. The agreement is retroactive from July 1, 2015 to June 30, 2019 and covers about 5,200 employees. PRINCETON, N.J. (AP) — Former Gov. Chris Christie will live on in New Jersey's statehouse in one of his familiar poses. The Record reports the portrait cost $85,000, making it the most expensive in state history and more costly than his three predecessors' combined. TRENTON, N.J. (AP) — Commuters across New Jersey are facing a slow ride to work one day after a blast of snow and sleet brought traffic to a stop and led to a wave of criticism of Gov. Phil Murphy. BEDFORD, N.H. (AP) — Former Republican New Jersey Gov. Chris Christie criticized Democratic Pennsylvania Gov. Tom Wolf and Pittsburgh Mayor Bill Peduto for declining to join President Donald Trump on a visit to the city where 11 people were killed at a synagogue. BEDFORD, N.H. (AP) — Former New Jersey Gov. Chris Christie is criticizing Pennsylvania Gov. Tom Wolf and Pittsburgh Mayor Bill Peduto for declining to join President Donald Trump on Tuesday as he visited the city where 11 people were killed in Saturday's mass shooting at a synagogue. Christie says Trump's visit was an attempt "to bring the country together." Chrisitie was interviwed during a stop in New Hampshire on Tuesday to headline the state Republican Party's major 2018 midterms rally. TRENTON, N.J. (AP) — Gov. Phil Murphy is bringing his predecessor's attorney general on board to help investigate his administration's handling of a sexual assault complaint by a state official. The Democratic governor's office released a statement Monday from former Attorney General Chris Porrino. Porrino, who served under Republican Chris Christie from 2016-2018, says he's helping respond to information requests regarding an investigation Murphy announced last week. GLASSBORO, N.J. (AP) — Chris Christie, New Jersey's former governor known for blunt talk like telling people during a hurricane to "get the hell off the beach," opened up for the first time about his successor Phil Murphy on Thursday, ribbing him about politely asking people to exit the shore during a storm and criticizing his budget for raising taxes. TRENTON, N.J. (AP) — An attorney who represented a defendant in the George Washington Bridge lane-closing case has been selected to advise a legislative committee probing Democratic Gov. Phil Murphy's handling of sexual assault allegations against a former staffer. Michael Critchley will act as counsel to the bipartisan committee formed this week. CRESSKILL, N.J. (AP) — Crews filming a new NBC spy thriller at a palatial suburban home were greeted Friday by Gov. Phil Murphy, who stopped by to say a New Jersey production tax credit is up and running. Murphy, a first-year Democratic governor, and the Democrat-led Legislature approved the new tax credit program in July, renewing an incentive that Republican Chris Christie let expire. NUTLEY, N.J. (AP) — New Jersey Gov. Phil Murphy on Monday unveiled a proposal he says could jump-start the state's lagging economy by auctioning off tax credits to attract private venture capital investment and to overhaul how the state doles out tax incentives. TRENTON, N.J. (AP) — New Jersey Gov. Phil Murphy says he will put forward an economic "master plan" during a speech Monday on the state's laggard economy. In an interview with The Associated Press, Murphy said the state needs to reverse downward-trending wages and employment growth figures, as well as the poverty rate. He revealed few other details about changes he's planning. TRENTON, N.J. (AP) — New Jersey Gov. Phil Murphy is taking his administration's health benefits review on the road. The freshman Democrat announced this week that the task force he put together this summer to review New Jersey's multi-billion-dollar public worker health benefits will go on a three-stop listening tour. MORRIS PLAINS, N.J. (AP) — Former New Jersey Gov. Chris Christie has helped christen a new road that's named after him.